When I picked up this book, I thought the best way to reduce my clutter is to not keep buying books like this. I love Kondo's method of sorting: that which fills you with joy, keep. That which does not, get rid of. Her books are so much more vibrant than more decluttering books. And I secretly relate very strongly to her idea that objects resonate with the energy of how they are used. To me, this feels like a technicality. It's not a relapse, just temporary clutter. My house is very cluttered and I feel like it is mostly the habits that are at fault. Even if I got rid of many belongings and found a home for everything (granted, two things that would help a lot), I still think I would get sloppy. Sometimes I care about what my house looks like and sometimes I don't. It is this inconsistency that is really the problem. In her first book, I certainly didn't follow her instructions to the letter because there were some things that seemed practical to keep even if they didn't inspire me with joy. She clarifies her advice in Spark Joy. She found herself turning a screw with her fingernail because she didn't keep a screw driver. This absurd incident helped her realize that keeping things that make your life easier inspire joy as well. I appreciated the first section which described how to add joy to your house once you have gutted it of the unessential so that it is not too stark: things like decorating the insides of drawers with sentimental fabrics. In another section, she describes how to fold clothes in more detail with accompanying diagrams. I'm sure those who are trying to follow her instructions precisely will appreciate these additions. I actually skipped over them because they were too technical for someone who hasn't yet committed to decluttering. For those who loved the first book and want more detail, I am sure they will appreciate this companion. 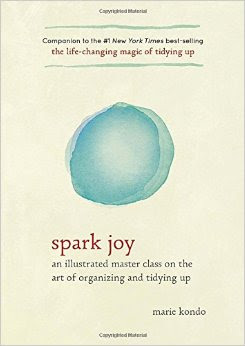 But for those who just want a general approach to tidying, the first book suffices.